Kia Williams, MS, RYT 200 is an experienced yoga teacher, group fitness instructor, and personal trainer who teaches multiple formats, including Hatha, Power, and Vinyasa yoga. Kia started her yoga journey over twelve years ago and has engaged in various yoga training styles and workshops. Kia is formally trained in the Kriya Yoga practice and is a proud graduate of the Sunstone Yoga Academy in Addison, Texas. She has managed the fitness and wellness programs at the University of North Texas, Texas A&M University-Commerce, and the University of Illinois. 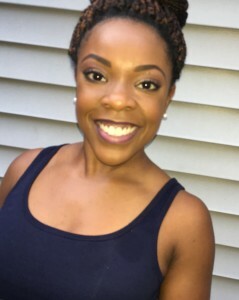 Prior to pursuing a fitness career at the collegiate level, Kia worked in television production and was freelance writer on topics of health and wellness. Kia holds several specialty certifications, is a master trainer for Barre above™ and PulsePointe Barre, and a former competitive athlete and power lifter. Kia leads workshops and teacher training courses around the country. Her focus is functional and purposeful movement. Kia is committed to helping others live a healthy lifestyle by maintaining a strong, fit, and balanced mind and body.